It's Monday, time to see what's cookin' in the Kitchen with Kitchen Sink Stamps! I used CPS130 as the inspiration for my sketch, rotating it to fit the 3 Step School Days images from Kitchen Sink Stamps. Before I stamped my images I cut two Red panels of card stock, using removable adhesive I placed the smaller panel in the center of the larger one, then using the Big Shot and the CuttleBug Numbers Folder, I embossed the panels. Removed the smaller Red panel and layered in on a Black panel then back on the larger red one. That way my embossed numbers matched up perfectly when I reassembled the panels. I used the Faux Collage Technique from a past TJNL to create my focal image. I stamped the book as follows: #3 Chocolate Chip, #2 Chocolate Chip stamped off, #1 Creamy Caramel. Masked the book with Eclipse Tape, then stamped the Ink Well as follows: #3 Black, #2 Going Grey Stamped off, #1 Sahara Sand. Leave the Book mask in place, then mask the Ink Well with Eclipse Tape, stamp the apple as follows: #4 Riding Hood Red, #3 Riding Hood Red stamped off, #2 Riding Hood Red stamped off, #1 Riding Hood Red stamped off twice. Stamps leaf: #2 Garden Green, #1 Garden Green stamped off. Leave all masks in place and stamp the ruler as follows: #3 Black, #2 Close to Cocoa, #1 Creamy Caramel. Sponge edges of all white card stock with Soft Suede Ink. Adhere to base card with dimensionals. Stamp sentiment in Black on White panel with a SAMJ, layer on Black panel, adhere to base card with dimensionals. Don't forget you can save 10% on all Kitchen Sink Stamps purchased when you use code LISA10KSS. 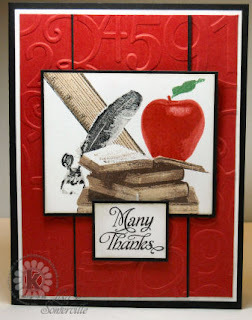 Very cute card, love the embossed background and that bright red apple!! Great composition. Beautiful! Colors, layout and images are just devine! What wonderful masking on this fabulous design, Lisa!! Love the sensational embossed numbers background!! I love your school theme card, Lisa!! All maskings are fabulous!! I love the emobossed background, too!! Oh my, Lisa! This is just amazing! Love this faux collage technique with these images...wonderful!! Beautiful job with the masking, Lisa--this looks fabulous! The embossed number background is the perfect complement to the images. Wow! Love the composition. You did a gorgeous job working with all those images. They flow together nicely! Such a great card Lisa. Wow, that is a whole lot of amazing stamping! LOVE this.